Smartly blending its development agenda with Hindutva politics, the BJP has not lost an assembly election in the state since 1995. With the Election Commission announcing the Gujarat Assembly polls, the stage is set for a high-octane electoral tussle between the ruling Bharatiya Janata Party and the opposition Congress in Prime Minister Narendra Modi's home state whose outcome may impact the 2019 Lok Sabha polls. The polling for the two-phase elections will take place on December 9 and 14 and votes will be counted on December 18. 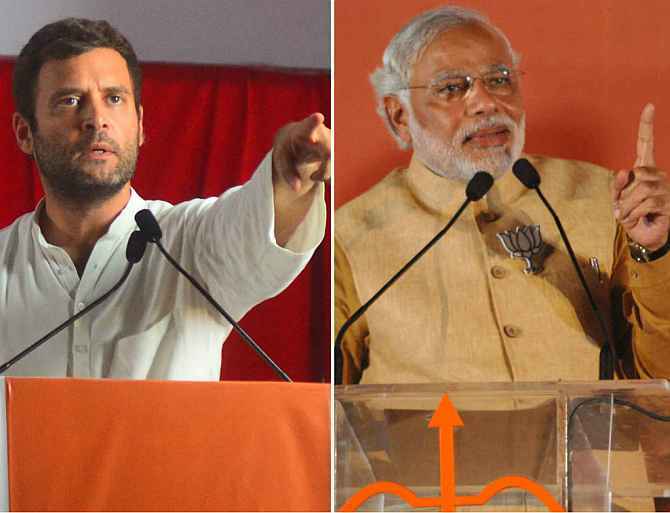 The two main contenders for power, however, have already launched high decibel campaigns, with both Modi and Congress vice president Rahul Gandhi addressing several rallies in the state in the last few weeks. The political rivals have also launched aggressive social media campaigns targeting each other. The Gujarat assembly elections are being seen as a major test of popularity of Modi and the poll management skills of BJP chief Amit Shah, both of whom hail from the state. The elections would also be a referendum of sorts on key economic reforms initiated by the Modi government, including the roll out of Goods and Services Tax regime and demonetisation. Gujarat, with its large trading community was impacted by both the decisions in a major way. The battle for Gujarat is equally important for the Congress and Rahul Gandhi, who is leading the party's campaign from the front at a time when speculation is rife about his impending elevation as party president. A success in Gujarat will be a big feather in the cap of Gandhi under whose virtual stewardship the party has been losing state after state. The key western state, considered the BJP's laboratory to test its Hindutva politics, has seen a string of protests against the government, including one for reservation in government jobs and educational institutions by the influential Patidar community-led by Hardik Patel. The Patels have been the bedrock of the BJP's support base, apart from the upper castes and Vaishyas, the trading community. A significant erosion in the Patidar support base may dent the chances of the party which has been ruling the state for over two decades now. The Congress party suffered a series of setbacks in the run-up to the elections after its towering leader and former chief minister Shankarsinh Vaghela quit the party, triggering a revolt which saw several of its MLAs resigning from the assembly and walking over to the BJP. It can, however, take solace from OBC leader Alpesh Thakor joining the party days before the elections were announced. The BJP, on the other hand, may have to contend with anti-incumbency as its eyes a fifth straight term in office. The absence of a mass leader at the state level means that the saffron party will have to overwhelmingly depend on Modi's charisma to see it ensconced in the seat of power once again. It will also have to contend with some amount of rural distress over deficient rain over the last three years. Modi's 'son of the soil' tag, however, may do the trick for the BJP. The Congress too is plagued by the lack of a leader with pan-Gujarat appeal and acceptance. In the last Assembly polls in 2012, the BJP won 115 seats when Modi was the chief minister, while Congress pocketed 61 in the 182-member House. The BJP polled 48 per cent votes and the Congress 39, a difference of nine per cent. The state had witnessed a record turnout of 71.30 per cent electorate in 2012 and it was a hat-trick of victories for the party under Modi's chief ministership. In 2007, BJP clinched 117 seats and Congress 59, polling 49 per cent and 38 per cent votes, a difference of 11 per cent. In 2002, when the state went to polls under Modi for the first time in the aftermath of the communal riots that convulsed the state, the BJP won 127 seats and the Congress, 51. Amit Shah, the BJP chief under whose helmsmanship the party has scripted a string of electoral victories, has set a target of 150 seats this time. "Our preparation is complete. We are ready for the polls and we are going to win 150 plus seats," Chief Minister Vijay Rupani asserted on Wednesday. His deputy Nitin Patel said recently that the work done by the BJP government would stand it in good stead in the elections. Congress spokesman Manish Doshi said the party was ready for the polls and claimed the state wanted change. Both Modi and Shah have visited Gujarat several times, with the prime minister launching a slew of schemes worth several thousand crore of rupees. Rahul Gandhi has spent six days in the state in the last one month, mounting a scalding assault on the BJP governments in the state and at the Centre, and trying to puncture their claims about the Gujarat model of development. Gandhi made it a point to visit temples during every trip in an obvious attempt to blunt the BJP's charge against the Congress of Muslim appeasement and proffer the party's own soft Hindutva to voters.